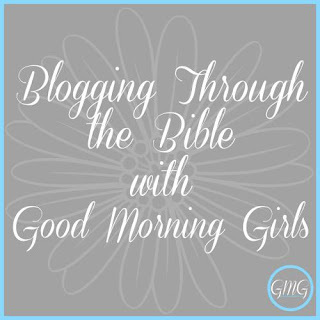 Welcome friends, to Week 2 of our Proverbs Summer Bible Study with the Good Morning Girls! Today we are in Proverbs 6. Teaching our children the importance of memorizing God's Word is one of the most valuable tools we can equip them with in their personal walk with the Lord. In our home we have tried to lead by example, the importance of God's Word, by spending daily quiet time in the Word as well as time of family devotions in the Word of God. We've taught our children to memorize verses in the Bible that they can use in times of trouble, fear, or doubt as well as verses of thanksgiving and praise. We've always stressed how the Bible has every answer to anything we may face in this life. This spiritual discipline will reap a harvest of spiritual fruit in the life of our children as truths from God's Word are brought back to their remembrance throughout their adult lives. My daughter, who is now a married woman with a child of her own, just shared with me the other day how Scriptures that she had hidden in her heart as a young girl continue to come to her mind today and help her in the season of life she is now living. Praise the Lord! Teaching our children the importance of memorizing God's Word will ensure that our children can take God with them anywhere as they journey through life. They will be ready for the spiritual battles of this life that can only be conquered by the sword of the Spirit! Let's get to equipping them now! Here are some fun ideas that we have used to make memorizing Scripture fun! 7 Ways to Make Memorizing Scripture Fun! Write the verse down on slips of paper. Fold each piece of paper and place them individually inside balloons. Blow up the balloons and tie with the Scriptures inside. Let your children stomp the balloons to pop them. Gather the pieces of paper and put them in the correct order of the verse. Say the Scripture verse together. Use a dry erase board to write the verse on. Say the verse together and then pick a word of the verse to erase. Say the verse again, filling in the missing word. Repeat until the entire verse has been erased and your children are saying it from memory. Have your children write the verse on an index card and place it on their bedroom or bathroom mirror so they will see it each morning. Recite the verse while getting dressed or brushing their teeth. Buy pretty journals for your children to keep their Scripture memory verses in. Each day they can write their memory verse. At the end of the week, the verse should be well hidden in their hearts! Scripture Release is a wonderful website that puts Scripture verses to music! Let your children pick out the Scripture verse they want to memorize and download it for them so they can listen to it throughout the day. It won't be long before they'll be walking around the house singing their Bible verses! Godstruck Ministries for Kids is a Christian family who have produced a curriculum using music and motions to help children memorize God's Word. I had the privilege of meeting them at our local homeschool conference two years ago. They asked me to write a review of their products which I was more than happy to do (Scripture Songs for Kids)! I hope these ideas will inspire you to help your children memorize God's Word! 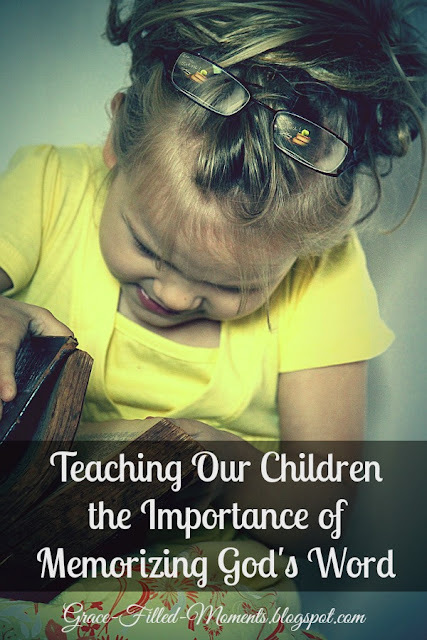 After all, teaching our children the importance of memorizing God's word is a valuable tool that they will be able to carry with them well into their adult lives. That's right...you and I still need to keep this spiritual discipline in our lives so that we can pray God's Word back to Him as we journey through this life! We see in verse 22 how God's Word leads us, keeps us, and speaks to us. Time spent in God's Word and memorizing God's Word will never return void as we carry it with us in our hearts.